As you’ll learn in this post, everything you need to go from Green Pea to Superstar is found in these three little steps. Those who follow this advice will thank me in a few months; those who do not? Well, they won’t even remember my name (because they’ll be flipping burgers). While selling cars is certainly not for everyone, nearly everyone can succeed at it if they’re willing to genuinely put in the work. It truly is one of the only careers where anyone can create their own successful small business with nothing but sweat equity. If you’re a Green Pea, you probably already heard your sales manager or the hiring manager tell you this. Well… believe them. It’s true! Regardless of the reason you took this job, you took it… so do it. Be all-in on selling cars or get out now. There is no lazy man’s way to sell thirty cars. Moreover, those who succeed at selling cars are committed to selling cars – even if they weren’t 100% convinced it was for them initially. They made their calls, they followed their managers’ advice, they learned about the product and they walked their inventory every day. What’s more is they made sure everyone they ever met knew they were now selling cars. 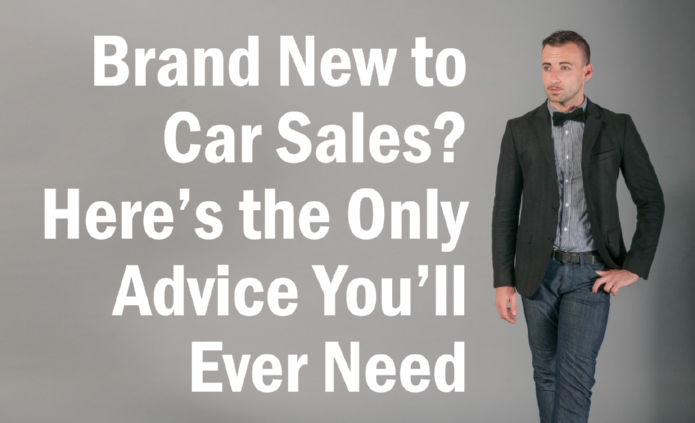 Here’s a tip: Everyone wants a friend in the car business. This means your friends and family need to know that you’re selling cars and that they can count on you to help them out. If you’re embarrassed about selling cars or if this job is just some “placeholder” until you find something better, you will soon fail. You will soon be unemployed. It’s too bad you weren’t all-in on selling cars; top automotive salespeople easily earn six-figure incomes. What’s that job at McDonald’s going to pay? Tell yourself this until you believe it; until you start to live it every day. This is called networking; and top sellers generate most of their income from their repeat and referral business. While you’re too new to the business to generate repeat customers, it doesn’t mean you can’t start generating some of your own referrals. This won’t happen if you’re not all-in or if you don’t love selling cars. I wrote a 400-page book for you, the Green Pea, called Assumptive Selling: The Complete Guide to Selling More Vehicles for More Money to Today’s Connected Customers. While there are also lessons for managers and dealers in this book, I truly wrote it with the Green Pea in mind. In Assumptive Selling, you’ll learn how to successfully network (both the old-fashioned way and via social media); you’ll learn how to answer the phone in a way that sets more appointments that show; and you’ll learn how to greet every Up in a way that will quickly get you to a 90% or more demo drive rate! Yes, the book costs $50. But, if your success is not worth $50, then it’s time to find a new career before you waste any more of your time or the dealership’s. This is not a book with a few “helpful tips” designed to take you from 8 cars to 9 cars a month. 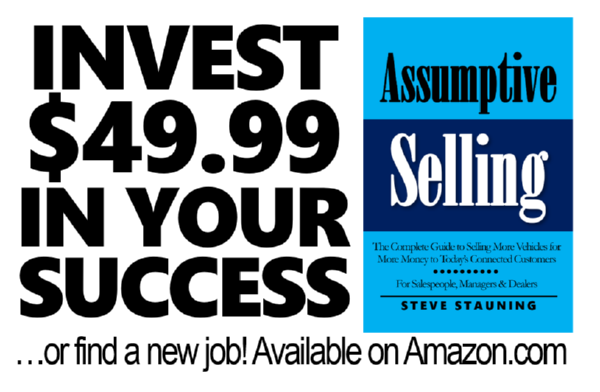 Go all-in on Assumptive Selling – follow the advice to the letter – and provided you learn to love selling cars and provided you’re not just giving the steps lip service, you’ll quickly be selling 30 or more units every month! About TheManager: Steve Stauning is the author of Assumptive Selling: The Complete Guide to Selling More Vehicles for More Money to Today’s Connected Customers; as well as a respected automotive industry veteran and founder of pladoogle, LLC – a leading training & consulting firm – and the free sales video training website SteveStauning.com. Prior to his involvement with pladoogle, Steve served in various automotive leadership roles, including as the Asbury Automotive Group’s (NYSE: ABG) director of ecommerce, the director of the Web Solutions division of Reynolds & Reynolds, and as the general manager of Dealer Web Services for Dominion’s Dealer Specialties.